One look under the hood of any vehicle and you may wonder just what does everything do in there? While the greasiest of greasemonkeys and the headiest of gearheads could have a hard time placing one or two parts, the average driver may only know a few general areas by sight. That’s because most of us can get by knowing the essential facts about our vehicles’ inner-workings. Oil dipsticks and batteries are need-to-know items for every driver — another one should absolutely be the alternator! If you’re not sure why, brush up below with Park Muffler’s guide to your vehicle’s alternator, what it does and when to replace it. 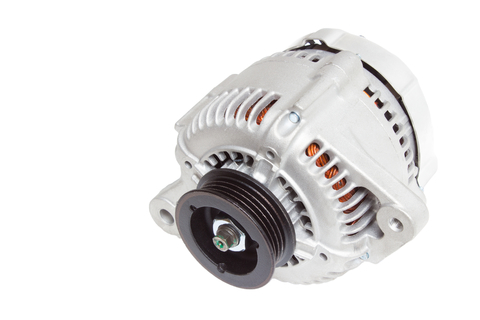 Alternators are very simple, ingenious machines that serve a vital function in every vehicle that relies on a battery. Essentially an enclosed, spinning magnet– an alternator converts some of the momentum created by a running engine into electricity, that is then used by the vehicle’s own electrical system. Almost entirely free of maintenance, most alternators can last over a decade thanks to advances in innovation and engineering. If your vehicle is running, your alternator is working! This simple belt-driven system sustains a fundamental purpose with no input from the operator. Once an alternator creates an electrical charge, it is distributed to both the battery and any system of the vehicle that uses electricity. This boost keeps your battery in peak condition and prevents those other systems from depleting its charge. When should I repair or replace my alternator? Battery light: Seems obvious, but many people ignore it… Until their car doesn’t start. Difficulty starting or requires jump start: Booster cables only work so many times if your battery isn’t being topped up by your alternator. Dim or dimming lights: Weak or flickering exterior and interior lights can be an early warning. Often occurs when the vehicle accelerates or is using multiple electrical systems (ie: A/V system, climate control, ABS, all-wheel drive, etc). Sounds and smells: Belts keep your alternator moving and they can wear out. Listen for changes in your engine’s sound and make note of any new odours after you exit your vehicle– these can be signs of a worn belt. The above are just a few examples and the only way to be sure is to have a certified technician check your electrical system. Computer diagnostics and voltage testing can be used to identify weak charging or low voltage, two surefire signs of an alternator that needs repair or replacement. If you think you may be experiencing alternator problems or any other issues, contact or visit Park Muffler today!